If you’re interested in learning smarter ways to create passing chords, then this lesson is for you. The role of passing chords in harmony and chord progressions cannot be over-emphasized; especially in the aspect of creating tension, and adding activity to chord progressions. This lesson will reveal another smart way that passing chords can be formed to major and minor chords. All I need is your undivided attention for the next 10 minutes or so. Let’s get started by reviewing the concept of passing chords. Passing chords are chromatic chords that are used to connect two diatonic chords. Before we proceed, permit me to define the terms diatonic and chromatic for you. A diatonic chord is a chord of the prevalent key while a chromatic chord is a chord that is foreign to the prevalent key. …are diatonic chords because they consist of notes in the key of C major. …which is a chromatic chord. …because there’s a C# tone in the A dominant seventh chord that is foreign to the key of C major. Let’s quickly demonstrate the application of passing chords in the gospel song I surrender all. 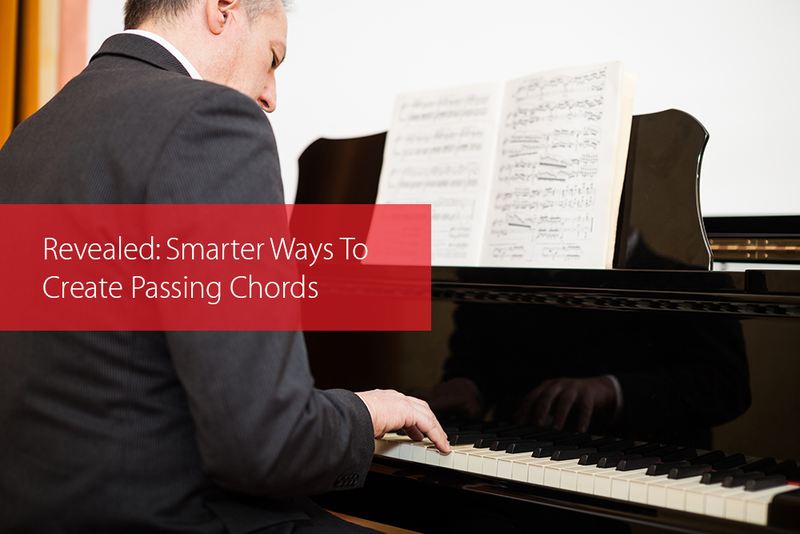 Let’s quickly learn a smarter way to form a passing chord to major and minor chords respectively. The smartest way to form a passing to any major chord is to go down a half-step below the root of the major chord and form a half-diminished seventh chord. …is a half-diminished seventh chord that is a half-step below the root of the C major seventh chord. …is a half-diminished seventh chord that is a half-step below the root of the E major seventh chord. If you’re interested in learning more about half-diminished seventh chords, click here. Just like we did in major chords, you can go down a half-step below the root of any given minor chord and form a diminished seventh chord. …is a diminished seventh chord that is a half-step below the root of the C minor seventh chord. …is a diminished seventh chord that is a half-step below the root of the G minor seventh chord. Learn more about diminished seventh chords. The diminished and half-diminished seventh chords are easy to form and are always a half-step away from any minor and major chord respectively. As long as you can recall these chords, I guarantee that you’ll not run out of passing chords.